"In this town, there is a belief that the souls of the people who died a violent death, and who had no relatives, can grant favors or perform miracles. But you must ask with faith." The town of Puerto Berrío sits on a bend in Colombia's Magdalena River. For over 30 years, local townspeople have fished out the remains of victims of violence drifting downstream. Through this collective ritual, the people of Puerto Berrío say to the perpetrators of violence: In our community we don't allow your victims to disappear; we may not know who they were, but they will become a part of us. With "Réquiem NN," artist Juan Manuel Echavarría, whose work addresses the ways in which we respond to violence, takes his camera into a community that restores the value and dignity of life while confronting bitter cruelty and loss. When the paramilitaries came into the Middle Magdalena region to fight the guerrilla groups at the end of the 1970s, the mid-sized town of Puerto Berrío stood at the center of the conflict. Enduring uninterrupted cycles of violence, the town became the place where local citizens recovered unknown bodies coming downriver. Every year during the month of November, when the Catholic Church commemorates the Souls of the Dead, the cemetery doors open at midnight and a man in a black cape – the Animero, or Soul Keeper – invites the faithful to follow in procession, carrying candles in prayer for the souls of the departed to obtain eternal rest – known in the Latin liturgy as Requiem Aeternam. As the Soul Keeper has said: "There are more graves with NNs in the cemetery of Puerto Berrío than there are regular tombs of townspeople." The practice of adoption of NNs is anchored in a long-held belief that those souls who are in purgatory have the power to intervene in favor of the living. Recognizing the desire of the NNs to find a place of rest, and providing a sense of respect in the face of violent death, the ritual stands as an expression of humanity. "Réquiem NN" focuses on the daily lives of some of the adopters and the stories behind some of those tombs marked NN. Juan Manuel Echavarría, an artist working in photography and video, has focused on representing Colombian violence and its effects on ordinary lives. He first visited Puerto Berrío in 2006, after reading a newspaper article about the practice of adopting the souls of the dead. 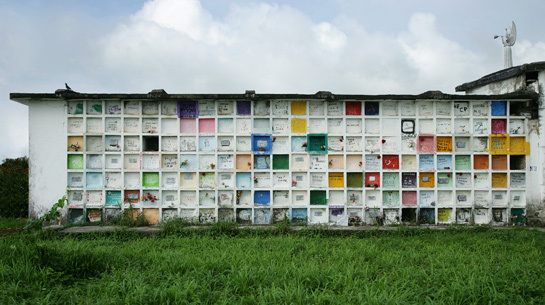 The photographs he made over several years, documenting the graves and their ever-changing facades, have been exhibited in Colombia, the United States, Canada, Australia and Estonia. "Réquiem NN" is his first film. For more information about his work, visit www.jmechavarria.com. With my photographic work in Puerto Berrío (2006–to date) I focused on documenting the tombs of the NNs. But then, I realized I needed to shift my attention to the townspeople to continue to piece together the story of Puerto Berrío and the adoption of the NNs. As I got to know the people better, I was inspired to make this film about their lives. In November 2010, I was chosen to show my photographs of the NN graves at the inauguration of the town's cultural center. That exhibition allowed the community to realizes the dimension of their ritual. It also opened doors for me in the town. In a society torn apart by a long history of violence, such as Puerto Berrío, people have a great need to tell their stories and be heard. Some of these are the protagonists of this film. The shooting was accomplished over five visits to Puerto Berrío with a small professional crew. Most essential to the success of our work was that we were all thoroughly captivated by the stories we began to hear. Beginning to end, the film took two years to complete. LUIS CARLOS GAVIRIA, a fisherman, who has navigated the waters of the Magdalena River for many years. He has lost two brothers to violence in Puerto Berrío. HUGO RAMÓN ANTONIO MORALES, the gravedigger and keeper of the cemetery. BLANCA NURY BUSTAMANTE, mother of seven children, takes in laundry at home and cleans houses. Her daughter Lizeth and her son Jhon Jairo have disappeared. HERNÁN MONTOYA, the Soul Keeper, conducts a procession every evening during the month of November to pray for the Souls in Purgatory, especially the NNs. JAIR HUMBERTO URREGO, a salesman, adopted an NN and baptized her Gloria. MARÍA DILIA MENA DE FAJARDO adopted a female NN and baptized her María de los Angeles, asking her to be her daughter's guardian angel. MARTHA CORREA, a devout follower of the Souls, has an altar at home, with candles and saints, as well as photographs of friends and relatives who have died violently. She has also adopted NNs. JESÚS ENRIQUE VALENCIA transported the dead on his tricycle in the '80s and '90s witnessing the peak years of violence in Puerto Berrío.